Say Bye Bye To Acne! Morning Beauties! Todays topic of conversation is all those annoying red bumps full of pus and blackheads that we all hate! Yes you guessed it! I am talking about acne and what are my secret weapons of choice to beat these suckers to the ground! No matter what skin type you have you will get some sort of acne in your lifetime. Some can be what you eat, others can be hormonal and then we have the mistakes that we make of not taking care of our skin. I listed below all the products I use to keep my skin under control as much as I can. Also down below you will see a face chart which helps understand why we get acne in certain parts of our faces. Which then we can know what to avoid to stop them from popping up! 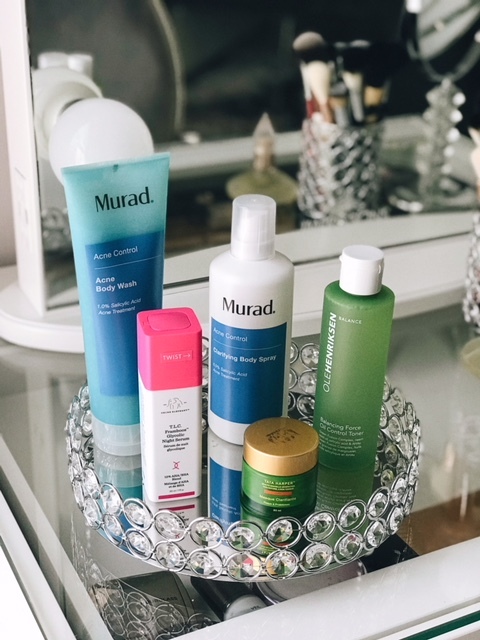 My go body products for acne are from Murad! I linked them above so you can purchase them. They are amazing and they never leave your skin dry or irritated. My favorite would be the after washing my body applying the clarifying body spray. It has a 360 degree nozzle which allows you to get to all areas of your body including your whole entire back! The products listed above are my 100% go to keep my face in check. I use a nightly glycolic serum from Drunk Elephant to clean out my pores. The set from Ole Henriksen I swear by for oily to combo skin! And my absolute favorite mask is from Tata Harper! I promise you your skin will clear up using these products! We always wonder why we breakout on our face even if we take care of our skin to perfection. Sometimes what we do to our bodies can also cause chaos to the face. What we eat, our stress levels, sweating, not washing our makeup off, clogging up our pores, smoking or drinking! You name it and it can get your face poppin. Sorry for all the acne puns lol. This chart below will help you better understand what to avoid doing to yourself so you don't get acne.